16 riders out, great ride including lots of lanes between Mow Cop and Endon new to most of us. Jacksons Nurseries Tea Room has certainly upped its game from its rather shabbier incarnation a few years back when its Day-Glo Lemon Cake gave me palpitations just looking at it (hard to miss even though the cakes were curiously displayed in a corner the other side of the room from the till). Plenty of baked beans on my plate, friendly and speedy service, not phased by there being so many of us, soya milk available, big stove, this place may well be a podium contender in my eagerly awaited forthcoming ITV4 mini-series, working title: ‘Cafes I have loved. One man’s journey’, particularly since the previous titleholder the Longnor Craft Centre is presently closed and awaiting a rumoured February relaunch under new ownership. Good ride, well done to everyone for keeping together. I blame my post-lunch Cliff Bar (peanut butter) for upsetting my finely tuned power to weight ratio at mile 33 on Gratton Lane, leaving Endon Bank, resulting in a broken spoke, potentially my most serious mechanical since locking my teddy bear in the integral boot of my red Triang Tricycle (with genuinely puncture-proof tyres - they were solid rubber) in 1959. Fortunately Master Mechanic Darren of AllGood Cycling was on hand, taking time out from publicising his Croatian Cycling Holidays (there I’ve just done it for you Darren) stepped up to the plate and adjusted my remaining spokes with the sensitivity of a professional harpist to set me off homeward bound, good as new. I returned home at 3.15 shortly before the rain started, having clocked an average speed of a bang on target 12 mph, in good time to ‘freshen up’ before my evening gig as Quiz Master at the Big Quiz Night in aid of Tearfund at our church, Holy Trinity Hurdsfield, sample question: Name the two old men from The Muppet Show. Answer: Statler and Waldorf, believed to be modelled on a pair of elder statesmen of the Wheelers. But which ones, I wonder? Larks and Larklings mingle in friendly rivalry as we count down the tension-laden seconds to our joint 10.00 am departure. L to R Phil, someone else not actually on either ride (don’t they know we charge appearance fees? 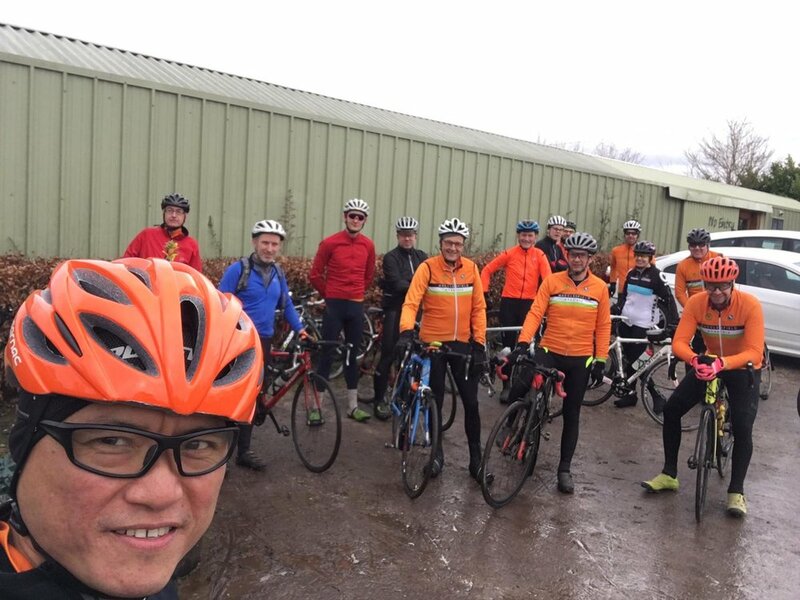 ), Pete M, Christian A, Dave W, Dave L, Ian, Simon G, Tom, Pete H on his first ride with the club (welcome Pete), Andrew, Christian S, Matt (welcome back to week two Matt), Pete J, Darren, Russell, Adele, Mark H, Simon R, Kirsten, Steve, Vikki, Mark B, Mike. Actually it wasn’t foggy; maybe what I believe used to be called a ‘viewfinder’ had misted up in my pocket with my exertions on the preceding hill (haven’t got to that part of the instructions yet). The team reassembles for The Road Home.